In addition to being a great place to work out, the YMCA of the Greater Twin Cities offers a variety of programs designed to help young people overcome barriers and open doors to limitless opportunities. As a member or donor of the Y, you’re part of something bigger—a movement to build thriving communities for future generations. Our commitment to children and youth is demonstrated through a deep and diverse stable of initiatives. Through Youth Intervention Services, Eric gained the skills and support needed to secure housing after living in multiple foster homes, and Jermeisha worked with life coaches to gain employment, support her children and pursue her dreams. Imane built relationships with a grant to improve the campus environment by examining interfaith at the University Y. Thousands of kids have access to educational, recreational and leadership development activities in partnership with the Minneapolis Beacons Network. Hundreds of kids and families get connected to pathways to break the cycle of poverty through Neighborhood Centers. 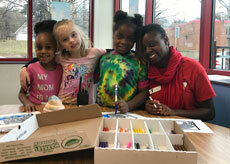 Children in grades K-12 participate in initiatives to improve water safety, learning loss and healthy living at the Harold Mezile North Community YMCA Youth & Teen Enrichment Center. We relentlessly pursue new ways to push what’s possible, challenge limits and open doors so everyone has an equal chance to succeed. Learn more about these programs, and how you can stand with us to stand up for youth.